In an investigation of Global Fund grants to Mozambique, the Office of the Inspector General (OIG) has found that the Executive Secretary of Mozambique’s Country Coordinating Mechanism (CCM) was responsible for non-compliant expenditures of $26,020 over the period of a year between 2016 and 2017, by claiming false expenses and vouchers. Of this, $22,593 was fraudulent. The OIG’s investigation report was made public on 13 November 2018. The report focused on three main findings, headlined by the embezzlement of funds by the Executive Secretary of the CCM; the second and third finding – lapses in financial controls by the CCM funding recipient (the PR, in this case), and inadequate CCM oversight and governance – were seen by the OIG as contributing or enabling factors of the embezzlement. The payment of the embezzled funds was made by the Principal Recipient, the Fundacao para o Desenvolvimento da Comunidade (FDC), which provides financial support to the CCM (itself not a legal entity), including the administration of funds. The non-compliant expenditures, which included seven fraudulent expenditures ($22,593) and 17 unsupported vouchers ($3,427) come to a total of $26,020. The Executive Secretary of the CCM has already reimbursed $1,433 of this total; the OIG recommended that the Secretariat seek recovery of the remaining $24,587. Based on the OIG’s findings described in this report, the Executive Secretary of the CCM has been dismissed. In addition, in December 2017, the Secretariat instructed the CCM Chair and FDC Executive Director to develop a clear set of guidelines for the management of CCM funds. The CCM Executive Committee is finalizing new CCM governance procedures, as well as a revised Memorandum of Understanding with FDC. The investigation was instigated by a Local Fund Agent (LFA) review of CCM expenditures. During this review, the LFA requested documents from the Executive Secretary to support some expenses claims the Executive Secretary had submitted. The LFA found three unsupported payments made by FDC to the Executive Secretary, who immediately admitted that he had submitted vouchers for reimbursements related to CCM oversight visits that had not taken place. The Secretariat notified the OIG of the LFA’s findings on 13 February 2018. The embezzlement of funds by the CCM Executive Secretary: Between September 2016 and October 2017, the Executive Secretary of the CCM submitted seven fraudulent vouchers totaling $22,593 to the CCM funding recipient, FDC, to obtain CCM funds to which he was not entitled. (FDC was providing financial management support to the CCM, which was not itself a legal entity.) For four of the seven vouchers, the Executive Secretary created false supporting documentation; the remaining three vouchers were for advance payments, and did not include any supporting documentation. FDC paid a further amount of $3,427 for 17 vouchers submitted by the Executive Secretary that were “unsupported but not fraudulent”. The combined 20 fraudulent and unsupported vouchers represent 4% of all CCM vouchers approved by FDC between 2015 and 2017. Lapses in financial controls by the CCM funding recipient: An absence of guidance for submitting and paying CCM expenditures “contributed to FDC’s lapses of oversight,” the OIG report said. FDC paid the four vouchers supported by false documents, because they appeared to be legitimate. But FDC also paid the other three fraudulent vouchers despite the lack of supporting documentation, and without following up with the Executive Secretary to obtain the missing supporting documents, settle outstanding advances, or obtain refunds for unspent portions of the advances that had been paid. Inadequate CCM governance and oversight: Lack of oversight by the CCM Chair and the absence of adequate CCM guidance documents were contributing factors in allowing the fraud to occur, the OIG said. Neither the MOU between FDC and the CCM, nor the CCM governance documents provided clear guidance on how requests for funds advances nor other CCM expenses should be processed, by either organization. When the CCM Chair became aware of the Executive Secretary’s submission of false vouchers, he did not notify the Global Fund, as required by the terms of the CCM funding agreement. The report identifies “fraud” and “non-compliance with grant agreement” as the two types of wrongdoing identified in this investigation. The full amount of non-compliant expenditures be recovered ($24,587 taking into account one reimbursement of $1,433 already made). The Global Fund Secretariat will ensure that the Memorandum of Understanding between the CCM and the CCM funding recipient, FDC, is updated, so that it clearly outlines procedures for requesting payments and clearing advances. The Secretariat will ensure that the CCM revises its governance documents for the oversight of CCM employees, and the financial management guidelines for CCM expenditures. The Global Fund has signed a total of 19 grants with Mozambique, worth $1.5 billion, of which $937 million has been disbursed. Six grants are active ($1 billion) of which $464 million has been disbursed to four Principal Recipients, with the Ministry of Health responsible for the largest HIV grant. Mozambique is a ‘high impact’ Global Fund country (very large portfolio, mission-critical disease burden) with a population of 28.8 million people, the lowest per capita health expenditure in the southern African region ($42), and a critical shortage of healthcare workers (1.74 per 1,000 people, compared to WHO’s recommended minimum of 2.5 per 1,000 people). Mozambique is ranked 181 out of 188 countries in the UNDP human development index report. 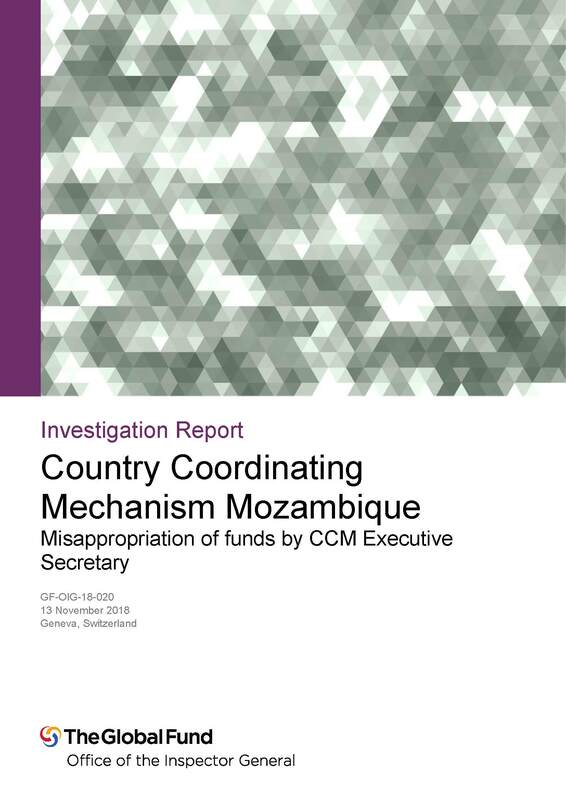 The full report of the OIG investigation into embezzlement of Global Fund grant funds in Mozambique is accessible on the Global Fund website.